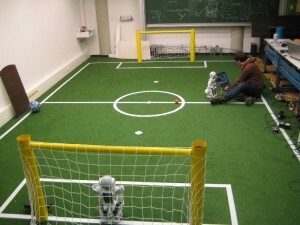 According to the new rules for RoboCup 2012, we prepared our soccer field in our Lab and construct two similar colored goals. From now on, all teams should recognize the opponent and own goal not just because of some color coded methods, instead, you should use other hints for deciding wether you should shot or not. 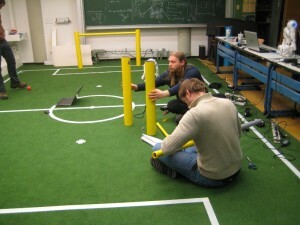 Soccer Field - With two yellow goals.